7 Days to Die coming June 28th! Hey there! Rick here from The Fun Pimps. 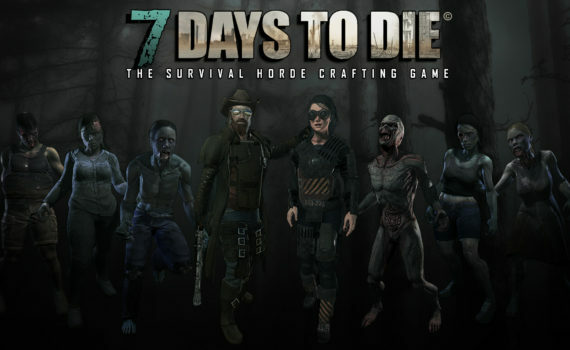 I’m thrilled to share a look at our “survival horde crafting game” 7 Days to Die with you! A few years ago, my brother and I talked about making a game that would combine elements of some of our favorite games into something new. We’re huge fans of the Fallout series, and Minecraft, among others, and so we started working on what would become 7 Days to Die. 7 Days to Die has sold over 1.5 million copies on PC, which is mind-blowing to us. We’re so grateful to have had amazing support from the community from the very beginning, and now, we’re beyond excited to bring our game to a new audience on PlayStation 4. So, what is 7 Days to Die? 7 Days to Die combines first-person shooting, survival horror, tower defense and role-playing elements in a mix of combat, crafting, looting, mining, exploration and character growth to create what we hope you’ll think is a unique, addictive experience. It’s an open-world sandbox game to play alone, via splitscreen, or online, that gives you an enormous amount of freedom to choose how to survive in a post-apocalyptic world. You’re dropped into a harsh environment with almost nothing – not even clothes on your back. Through scavenging, crafting, and hunting, you’ll eventually put together the basic items you’ll need to live. You’ll have to deal with cold, heat, hunger and thirst, and there are wild animals that see you as prey. But that’s not the worst, because you’re not alone — the undead wander all around you. Slow and relatively easy to avoid by day, at night they become merciless, fast-moving killers, hungry for your flesh. Once you have the basic tools of survival, you’ll need to find or make shelter. Start out with a humble wooden cabin, and over time, as your skills and scavenged loot improve, you’ll be able to build a fortress. Craft weapons, forge tools, sow crops, dig-in and survive. But even the most prepared survivalist can find that their well-laid plans can come crashing down around them…literally! Everything in 7 Days to Die is fully destructible and moldable, and just as you can shape the world to your needs, the undead can tear it apart. You might have reinforced the doors and windows, you might have crafted mines and traps, but what about the floor under your very feet? Did you strengthen the foundations? What if the undead dig right in from underneath you? We’re incredibly excited to be working with Telltale Publishing and Iron Galaxy to bring 7 Days to Die to PlayStation 4, with exciting new features and exclusive pre-order skins from The Walking Dead – A Telltale Games Series, including Lee Everett and Michonne! 7 Days to Die can be bought on-disc from your favorite retailer on June 28th!